Easy-to-use guide filled with activities and play ideas for every stage of a child's development up to the age of two and a half. 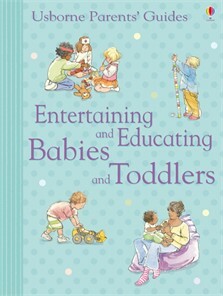 Arranged by age, it covers topics such as keeping babies busy, fun with food, toddler painting, messy fun and much more. Includes information on special needs, ailments, how babies develop and what to expect at each stage. With internet links to websites with parenting advice, downloadable pictures and flashcards and simple online activities. This book was a gift and I loved it from the first reading. I refer to it on a regular basis for ideas and for the weblinks. I always give this as a 'new baby' gift now. It is one of the books my son will choose to read when he wants to cuddle up and it is perfect for sharing. The pictures are enchanting and allow you to talk about the themes. The songs and rhymes pages are very well thumbed now. The weblinks are useful. A lot seemed to go to CBeebies, which we were already familiar with, but the playdough recipe has been a great success. This book was bought for me by my sister and it is absolutely brilliant, gives you really good ideas of how to keep little ones busy and learn at the same time. I am also a childminder and I refer to the book often when we are stuck for things to do.